Three Thrifty Guys would like to welcome new contributing writer, Laurie to the team. She will share her life experiences of raising 4 kids, getting out-of-debt and farm life. Learn more about her. When Charlie came up with the idea of the Goodwill Smackdown after his Abercrombie and Fitch find, I was intrigued. I’ve got a few friends who sell stuff on Ebay, so I knew there was money to be made there, but I had no idea how it all worked. Since we’re always looking for ways to increase our income, I knew this would be a good opportunity for me to try something new in the area of making money. This was my first trip to a Goodwill store, and like Charlie, I found the Goodwill store in our area to be clean and well-organized. The employees I encountered were also super helpful, and polite as well. I have to say I was pleasantly surprised at what a great shopping experience I had. I’m not sure what I expected on my first trip to a Goodwill Thrift Store, but I can say that the experience exceeded my expectations, in atmosphere, in quality of products and in price. On the particular day that I shopped the Goodwill store, blue tagged items were on sale for half off, so I concentrated on finding blue tagged items that were name brand and in great shape. I wandered the women’s section, headed over to housewares, then the children’s aisle. From there I went over to men’s and women’s jeans. I scoured the jeans racks and found five or six pairs of men’s and women’s jeans that were blue tagged. 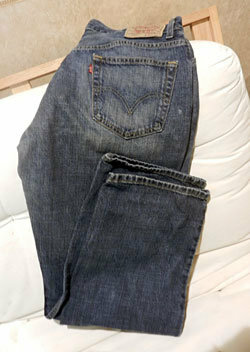 After inspecting them for quality, I decided to go with a great pair of Levi’s Men’s Indigo-Washed Jeans. They were in great shape, and were a common size, so I figured they’d be well-sought after. After the half price discount, the jeans were $3.49. Jeans like this easily go for $40 new, so I figured that was a good price. I had done some research on jeans, so I figure I’ll make close to triple what I paid for them. Hit the sales days, first and foremost. Yes, even with their more than reasonable prices, Goodwill has weekly sales! In our area of the country, Tuesdays start with half-price sales on a particular tag color. On Wednesdays, all of the leftovers of that particular tag-color go down to 99 cents. This is a great way to maximize your money savings either for items you need personally, or for items you wish to re-sell. Also, if you’re looking to re-sell, it’s a great idea to research Ebay and know which brands/items are selling for what. Then when you’re shopping at your Goodwill store, you’ll be able to spot a great deal right away. Whether you’re looking to save money or make money, I highly recommend the Goodwill Store as your first stop for shopping. It’s a great way to get clothes and goods at a fraction of retail prices. Wow, Mary! I’ve heard of people making pretty good cash doing this. It’s great to hear a real story of someone who’s been successful at it – thanks for sharing! This is how my brother makes a living. He focuses on shoes though. He cleans them up after buying them at Goodwill and sells for a pretty large profit. Thanks, Ruser! Yes, I was pleasantly surprised at the finds there. We’ll likely be shopping there more often! That seems like a really good find, Laurie! And thanks for the info on the sales; I think the closest Goodwill to me is about 40 minutes away, but I’d be willing to make the trip every once in a while for a good sale :). Good for you for going for it! I’ve heard about several people who are kicking it on this type of a gig. My wife and I find great stuff at Goodwill. Sometimes it’s hard for my wife to find something then turn around and sell it when she likes it so much. She finds name-brand items with tags still on them for cheap all the time. I have thought about trying to make some money at GoodWill for a while now, thanks for the motivation to do it!